There are 11 new Grocery offers from SavingStar available from today. 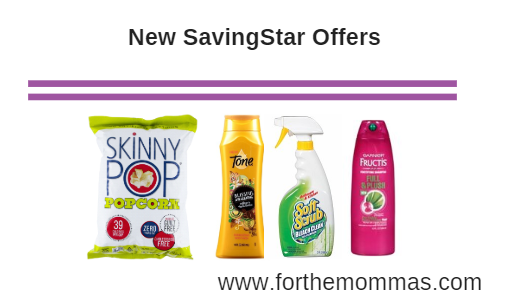 You can save up to $16.00 on Nature’s Bounty, Purex, Soft Scrub, Quilted Northern, Excedrin and more with the newest SavingStar offers. Save $1.00 when you buy ONE (1) bag of SkinnyPop® Ready To Eat Popcorn..Expires 10/31/2018.Save $1.00. Save $2.00 on ANY ONE (1) NATURE’S BOUNTY® OPTIMAL SOLUTIONS® vitamin or supplement..Expires 9/30/2018.Save $2.00. Save $1.00 on any ONE (1) NATURE’S BOUNTY® vitamin or supplement..Expires 9/30/2018.Save $1.00. Save $1.00 on any ONE (1) Soft Scrub® Toilet Care Product..Expires 9/9/2018.Save $1.00. Save $1.00 on any TWO (2) Soft Scrub® Products (20 oz. size or larger)..Expires 9/9/2018.Save $1.00. Save 50¢ on any ONE (1) QUILTED NORTHERN® Bath Tissue, 12 Double Roll or larger..Expires 9/5/2018.Save $0.50. Save $2.00 on any ONE (1) Excedrin® 20 ct. or larger..Expires 8/19/2018.Save $2.00. Save $1.00 on any ONE (1) Purex® Crystals™ In-Wash Fragrance Boosters (15.5oz. size or larger)..Expires 8/19/2018.Save $1.00. Save $2.00 off TWO (2) Dial® or Tone® Body Wash or Bar Soap (6-BAR OR LARGER)..Expires 8/19/2018.Save $2.00. SAVE $1.00 off TWO (2) Dial® Hand Soap Refills, Foaming Hand Wash Pumps or Bar Soap (3-Bar or larger)..Expires 8/19/2018.Save $1.00. Save $4.00 on ANY TWO (2) GARNIER® FRUCTIS® Shampoo, Conditioner, Treatment or Style. (Excluding 2 oz, 2.9 oz, 3 oz Trial Sizes. ).Expires 8/18/2018.Save $4.00.